Precious metals fell in tandem Wednesday with gold futures ending near a 5.8-year low and silver futures closing near a 6.3-year low. Gold for February delivery declined $9.70, or 0.9%, to settle at $1,053.80 an ounce on the Comex division of the New York Mercantile Exchange. The settlement price was the lowest since Feb. 5, 2010 when the yellow metal ended at $1,052.80 an ounce. Gold saw pressure, opined analysts, after the ADP jobs number came in higher than expected. "Traders are going to use the ADP report as a forward indicator of what should happen on Friday, knowing that they’re going to position themselves in anticipation for a rate hike," Bloomberg News quoted Phil Streible, a senior market strategist at RJO Futures in Chicago. Gold is "going to continue to sell off here." On Friday, the U.S. Labor Department releases its highly anticipated jobs report for November. Gold prices on the day traded from a low of $1,049.40 to a high of $1,071. They dipped 0.2% on Tuesday. Silver for March delivery fell 7 cents, or 0.5%, to close at $14.01 an ounce. The settlement was the weakest since Aug. 20, 2009 when the precious metal ended at $13.88 an ounce. 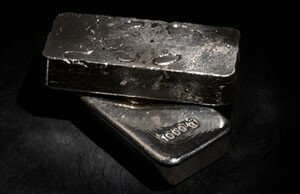 Silver prices traded from $13.90 to $14.21. They slipped less than a penny on Tuesday. January platinum dipped $3, or 0.4%, to $832.40 an ounce, ranging from $829.30 to $853.10. Palladium for March delivery tumbled $13.40, or 2.5%, to $525.80 an ounce, trading between $522.55 and $543.85. Gold fell $10, or 0.9%, to $1,055.40 an ounce. Silver fell 7 cents, or 0.5%, to $14.14 an ounce. United States Mint bullion sales were unchanged as of 3:50 p.m. ET. There is little room for advances with most American Gold Eagles sold out, all five-ounce America the Beautiful silver coins sold out, and the supply of American Silver Eagles gone until Dec. 7. The U.S. Mint set its weekly Silver Eagle allocation at 920,500 coins. The last of those sold on Tuesday.